Chariton Hills Conservation Bank is approved by the U.S. Fish & Wildlife Service (USFWS) to provide mitigation offsets for impacts to the Indiana bat (Myotis sodalis) and northern long-eared bat (Myotis septentrionalis) in Missouri. The Indiana bat inhabits caves and forests of the eastern and midwestern U.S. and has been federally listed as endangered for nearly five decades. The northern long-eared bat is a similar species that uses caves and forests in much of the eastern and midwestern U.S. and was federally listed as threatened in 2015. Currently, nearly one-third of the global Indiana bat population hibernates in an abandoned mine in Hannibal, Missouri, known as the Sodalis Nature Preserve. Northern long-eared bats hibernate in small groups in caves, mines and rock crevices scattered throughout Missouri, Iowa and Illinois. Upon emergence from hibernacula in the spring, these species migrate to establish summer maternity colonies in suitable habitat throughout northern Missouri, southern Iowa and western Illinois. The concentration of Indiana bats and northern long-eared bats in this tristate area presents significant opportunities to benefit these species within their entire range through summer maternity habitat preservation and long-term management. A USFWS-approved conservation bank can provide mitigation offsets to third parties who have project impacts within the bank service area in the form of pre-approved credits. The use of pre-approved conservation bank credits by clients can expedite permitting efforts, sever specific mitigation obligations, control costs and limit future Endangered Species Act (ESA) obligations. Conservation banks assist the USFWS and its conservation partners in meeting their conservation goals to effectively manage and protect these forest-dwelling threatened and endangered bats by conserving lands and consolidating smaller mitigation requirements into larger, more ecologically viable sites. The Chariton Hills Conservation Bank (CHCB) is protecting and managing over 1,300 acres of summer maternity habitat in Schuyler and Adair Counties in northeastern Missouri. 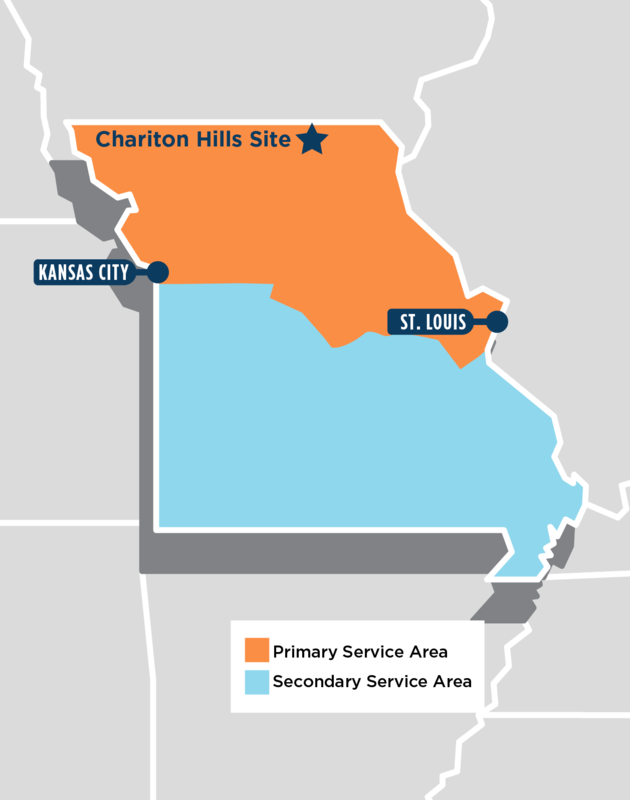 If you have a project located in the Chariton Hills service area, contact us today to learn how the bank can help. The primary service area consists of the northern half of the state of Missouri, mainly north of the Missouri River/Interstate 70 corridor, and the secondary service area consists of the balance of the state of Missouri. The CHCB comprises two sites in northeastern Missouri, both immediately adjacent to existing State of Missouri Conservation Areas: the Adair site in Adair County and the Schuyler site in Schuyler County. The Adair site is approximately 646 acres in size and is located approximately 4.5 miles south-southwest of Kirksville. Sugar Creek, a main tributary to the Chariton River, flows south through the western portion of the Adair Site and onto the Sugar Creek Conservation Area. The Schuyler site is approximately 675 acres in size and is located approximately 9 miles west-northwest of Lancaster. The western quarter of Schuyler County, where the Schuyler site is found, contains lands with some of the greatest topographic relief in the interior northern portion of Missouri, most of which are associated with the Chariton River and its tributaries. The Schuyler site is contiguous with the Rebel’s Cove Conservation Area. Interested in learning more about the CHCB and the mitigation credit types available? Please submit this form with your contact information and any relevant details, and we will respond promptly to discuss your needs.